- sac003_1 - Let the games begin with the very rare complete Super Bomberman Party Pak! You get the Super Bomber man game, the instruction manual, and the hard to find Multi connector, Super multitap, all in one neat package. Invite your friends and family to join you for bombastic thrills and chills in the hottest rare game yet for the Super Nintendo Entertainment System (SNES). Using the multi-connector Multitap Accessory up to four players can compete simultaneously in the ultimate game of elimination. Manufactured by Hudson Soft and released in 1993, the Super Multitap multiplayer adapter is a rare video game console peripheral that expands the number of controller ports available to players. With the SNES multitap multiplayer adapter, you can play SNES games with up to 5 players on games that allow this. One player uses controller port 1 with a regular controller, while this adapter allows 4 other players to use controller port 2. This is the original version, bundled with the popular Super Bomberman game. But the Super Multitap can also be played with 54 different SNES games, including NBA Jam, Street Racer, Madden NFL '94, Barkley: Shut Up and Jam, Lord of the Rings, Firestriker and many many more. The Super Multi-tap can be used with both the Super Nintendo System and Super Famicom System. 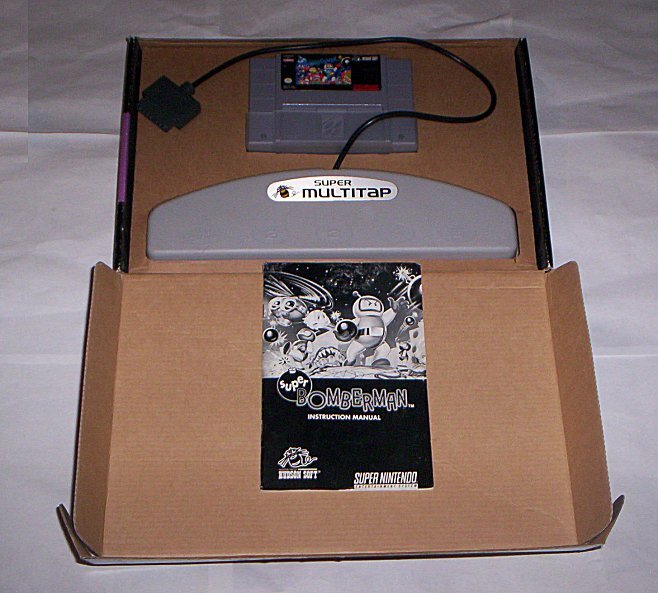 This multiconnector Super Multitap is pre-owned, in excellent condition, and complete with instruction manual. (Rarity Rating A) Pre-owned - Includes Game Only, no manual or instructions are included. Beetle Adventure Racing game review by "The Prince NES Gamer."